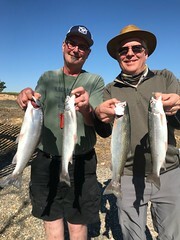 New client Pat and his two buddies Dan and John were onboard with me at Don Pedro on July the 25th to chase some kokanee. They were on time and we headed out to the fishing grounds. 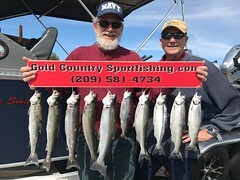 I set four rods rigged with kokanee gear at different depths it wasn’t but a few minutes and we were under way of catching kokanee and rainbows. The day was filled with laughs and stories. They caught 15 kokanee and turned most of the rainbows back. It was a great day of fishing and catching with three great guys. Thanks again guys!!!!!! 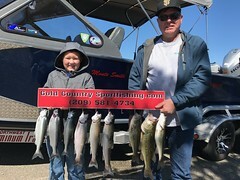 This entry was posted in California, Don Pedro fishing guides, Don Pedro Lake, Gold Country, Gold Country Sport Fishing, Kokanee. Bookmark the permalink.